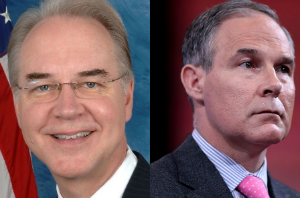 The Senate will soon vote on two nominees to President Trump’s Cabinet who would be disastrous for women at risk of and living with breast cancer: Tom Price to lead the Health and Human Services Department (HHS) and Scott Pruitt to lead the Environmental Protections Agency (EPA). There’s no time to lose. Please contact your Senators NOW and urge them to vote NO on both Price and Pruitt. Tom Price opposes the Affordable Care Act, while his proposed replacement plan would reduce access to healthcare for millions of people. We need an HHS Secretary who is going to work to expand access to affordable, quality healthcare—not eliminate it! Scott Pruitt has consistently attacked—and even sued!—the EPA, whose job it is to protect us from toxic chemicals. We need an EPA administrator who is going to protect us from chemicals that increase our risk of breast cancer—not work with corporations to bring the agency down! While Price threatens women’s access to breast cancer treatment, Pruitt could increase the number of women who need that treatment. *We have a new action center that will allow you to contact your legislator in various ways as well as opt-in to receive text messages from us for urgent actions like this.